DOWNEY – While outcry continues for the city to solve the local coyote dilemma, officials are saying that the solution is not as easy as it seems. The city of Downey recently held a meeting for residents to voice their concerns about a recent uptick in coyote sightings around the city, a problem intensified by the loss of several family pets. This meeting was also an opportunity for residents to get detailed information as to options the community is considering to combat the encroachment. According to Mayor Rick Rodriguez, the meeting was a success. One of the solutions to come out of the community outreach was the formation of a volunteer group similar to that of Gangs out of Downey. 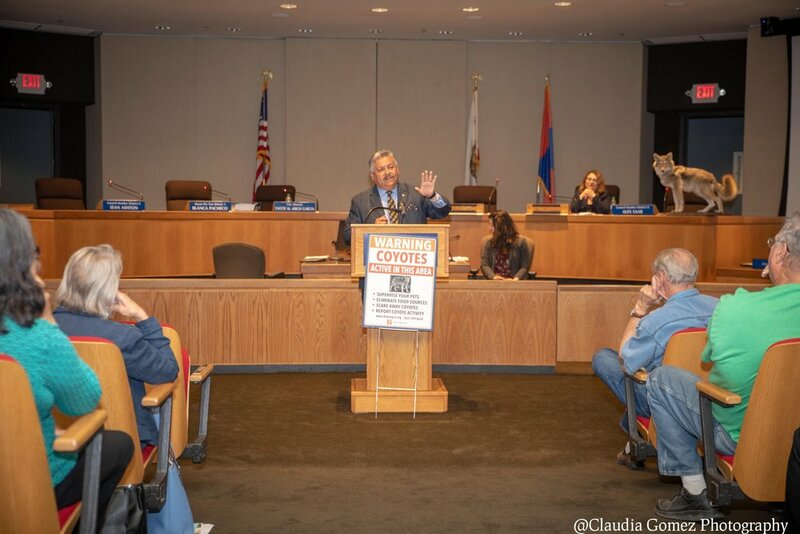 Mayor Rick Rodriguez speaks at a recent town hall meeting where the only item on the agenda was coyotes. Rodriguez adds that the city is also looking into cleaning up areas that may be overgrown with vegetation, updating the city app to include coyote sightings, creating a city run coyote watch on Facebook, posting signs, and possibly even creating a city ordinance to potentially dissuade and - if necessarily – fine residents who exhibit behaviors and habits that attract coyotes. The city has also established the City of Downey Coyote Management plan, which can be found on the city’s website. Despite the city’s newfound heightened interest on the issue, it comes as little comfort to many residents, especially those who have lost pets to the predators. One resident, Julie Fercho, witnessed the mauling of her neighbor’s dog by a coyote up close not long after moving into the city in 2016. Fercho also recently had her own personal experience with some coyotes just a few weeks ago. She says that she now believes that hazing doesn’t work on its own. Fercho says that while she respects the efforts of Mayor Rodriguez, the response is not enough. “This response to coyotes needs to be multi-tiered, needs to include not just a city-wide response, it needs to include a regional response,” said Fercho. Fercho is also increasingly frustrated that cities are hesitant to move on the issue for fear of backlash from animal rights activists. “It’s pretty concerning to all of us why cities aren’t more proactive about protecting us, and the encroachment of coyotes into our territory,” said Fercho. Unfortunately, Rodriguez says that it’s a lot more involved than just getting rid of each animal, and the city is trying to avoid spending tax dollars on costly lawsuits, or on a large number of potentially inefficient traps. Rodriguez’s own experiences using a coyote trap proved to be less than fruitful in addition to being expensive, only catching an opossum and being duped by a raccoon to the tune of around $250. While there have been a fair number of pets that have been killed by coyotes, Rodriguez says that there has yet to be a human victim in Downey. In addition, Rodriguez says that he feels the city has already seen improvement on the issue.